I recently completed David Margolick’s fascinating book, Elizabeth and Hazel: Two Women of Little Rock, which caused me again to reflect on the difficulty and challenge of authentic racial reconciliation in our country. 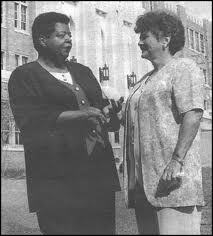 Elizabeth Eckford and Hazel Bryan Massery were frozen in time by a picture taken in 1957 during the court-ordered integration of Central High School in Little Rock, Arkansas. 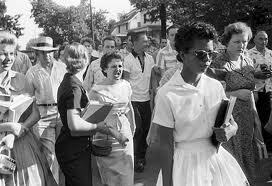 Elizabeth was one of nine African American students who voluntarily chose to fulfill a court order to desegregate the all white Central High School. 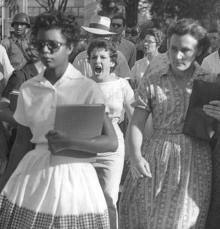 On the day they approached the school, the “Little Rock Nine” as they came to be called, were met with a vitriolic and hateful crowd of whites who berated them, spit on them and blocked their entrance to the school, as well as National Guardsmen ordered by Arkansas’s governor to prohibit them from entering. On that day for some reason Elizabeth was separated from the other eight African American students and had to face the mob on her own. In a famous picture that came to symbolize the white racism and hatred of the 1950’s South, Elizabeth walks in the foreground with the mob all around her. In the background, there is one white girl, Hazel Bryan, whose screaming face is filled with racist hate. Elizabeth and Hazel tells the story of that day and the chaotic first year at Central, and then chronicles the lives of these two women in the following decades up to the present. Ironically, neither Elizabeth or Hazel actually graduated from Central High School (both were 15 years old at the time of the picture). Elizabeth spent a year at the school every day being harassed to the point of tears, hit over the head with books, and spit upon. While the acts of hate were performed by a small group of white students, the vast majority of whites simply looked away, and decades later have yet to own up to their collective responsibility for the emotional turmoil Elizabeth went through. The next year she transferred back to the all black high school, and eventually joined the Army before finishing college as an adult. She never married but gave birth to two sons, and continued to live in Little Rock. Hazel on the other hand, was withdrawn from the school by her parents (in part because of the efforts at integration) and went to a small rural high school, but never graduated as she got married while still an adolescent. She became a mother and a housewife, very active in her church, and generally avoided the turmoil just a few miles away in Little Rock. However, the image of Elizabeth walking into a hostile crowd with Hazel screaming in the background was sent around the world and became the image of America’s inability to deal with racism. About eight years after the event when both women were in their twenties, Hazel called Elizabeth and offered a brief apology for what she had done that day. The conversation was brief, the apology accepted and little else was particularly memorable. Elizabeth, who had been a bright student with hopes of becoming a doctor or a lawyer, struggled with what much later was diagnosed as post-traumatic stress. She struggled with depression and went from job to job trying to recover. Then in the early 1990’s Hazel and Elizabeth began talking and meeting. Hazel reached out to Elizabeth and offered her both financial and emotional support that Elizabeth found empowering. Eventually they became “friends” and went around to schools and other public venues talking about the experience in Little Rock and the need for racial reconciliation. Their friendship became so memorable that in 1997 President Clinton gave them a special award on the 40th anniversary of the original event. However, there was always tension between the two women. 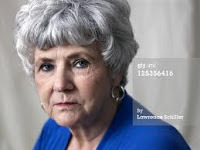 Through Hazel’s support and help, Elizabeth began to heal and come out of her depression, but as she did she became aware that Hazel seemed to gloss over the events 40 years earlier and had conveniently forgeotten some of things she said and did in those days when Elizabeth was being harassed. For her part Hazel felt Elizabeth was always bringing up the past and caught in negativity. Hazel also was publicly criticized and questioned about her sincerity; was she simply trying to rehabilitate her public image or had she really changed? Like many whites of her generation and even today, Hazel wanted to “put the past behind her” and move on without coming to grips with personal and historical responsibility for the suffering and pain that was caused by their hateful actions or their willful apathy. Hazel thought Elizabeth was stuck in the past, while Elizabeth thought Hazel only thought of the future to ignore what she had done. As a result the friendship eventually was strained to the point where neither woman spoke to each other. Margolick ends his book on that note, saying if the women every get back together it will have to be on their own private terms. As I read the book, I was particularly troubled by the actions and attitude of Hazel. 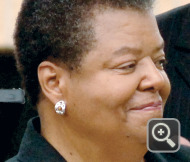 She seemed to minimize the impact of her actions or even the social milieu in which the events of Little Rock occurred. While she was directly involved in a way that many whites were not, her attitude reflects a general attitude among many, if not most, whites today who say that slavery, Jim Crow and the struggle for Civil Rights is past history, and that we don’t have to own up to it. Whites feel that they don’t have to recognize the tangible material and physical benefits that years of black oppression has afforded those of us who are white. Moreover, Hazel reflected to me the often shallow understanding of the pain and suffering still experienced by people of color in our society every day. We who are white don’t see that experience and so don’t acknowledge that it still exists. I often thought that somehow we need a Truth and Reconciliation commission in the United States, much like was conducted after the end of Apartheid in South Africa. Too often we who are white want reconciliation without truth. Every fall I teach a course on Race and Ethnic Relations in which students read two books on the history of racism and ethnic oppression (Racism: A Short Historyby Geroge Fredrickson; A Different Mirrorby Ronald Takaki) in the United States. What strikes me is how little my students (both white and students of color) know of this history, and how shocked they are that in their schooling they were only ever give the sanitized, superficial version. When they realize the central role that racism has played in their history and development of this nation politically, economically and culturally, it is hard to ignore the reality of personal and institutional racism still at work today. We will never get to reconciliation without first acknowledging the truth of our history and our corporate responsibility to build a society not only on freedom and equality, but also on justice for all. 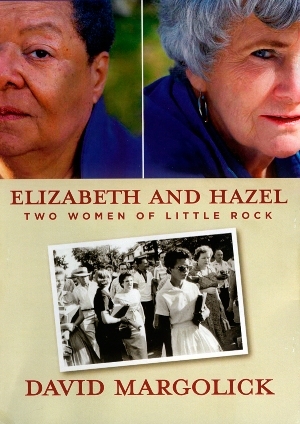 The fact that Elizabeth and Hazel ends unresolved is not only the story of two women of Little Rock, but also the story of a nation which was built on the back of slavery, committed virtual genocide against its indigenous residents, used Asians and Hispanics for economic gain, and continues to vilify Muslims and exclude immigrants in ways that reflect the worst of our history. Elizabeth and Hazel reminds us we can’t have reconciliation without truth, and that until that happens we as a people will be a racially fragmented and divided people.